Click on each thumbnail picture below, to view a full-sized image. 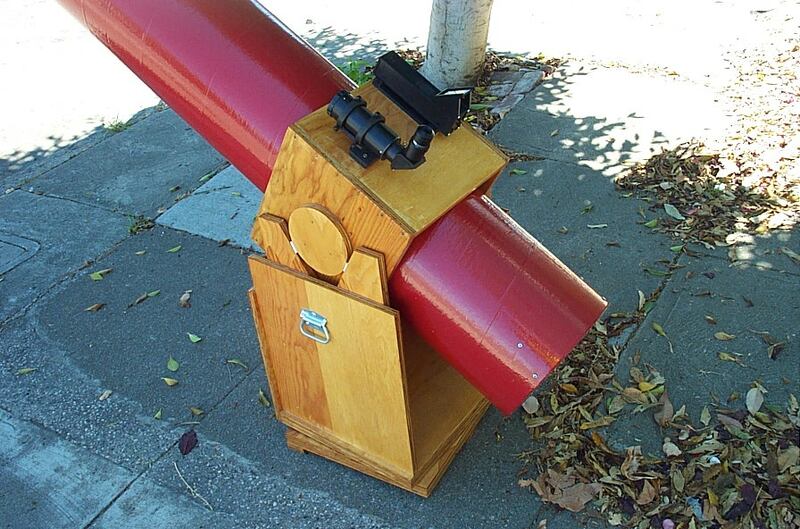 The telescope, set on the sidewalk in front of my house where it does the vast majority of its observing and public relations work. The main tube is twelve inches in diameter, and six feet long. 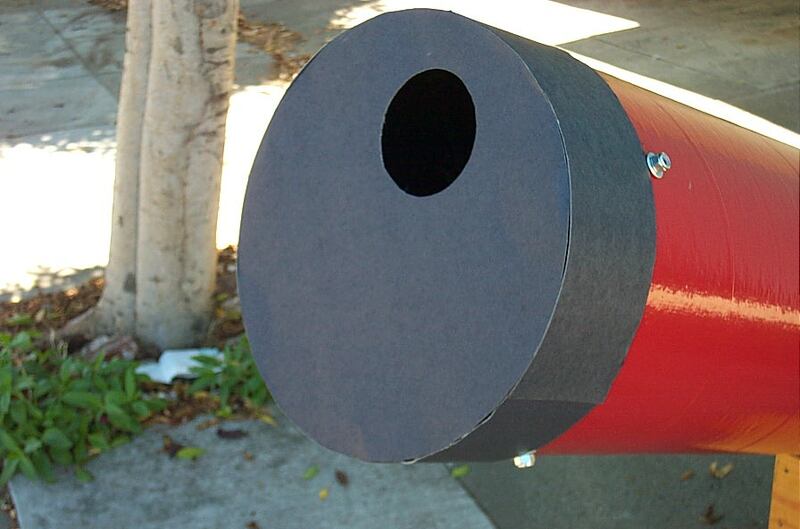 The tube is cardboard Sonotube, used in construction work for pouring cement columns. It is painted with several coats of red Rustoleum paint. 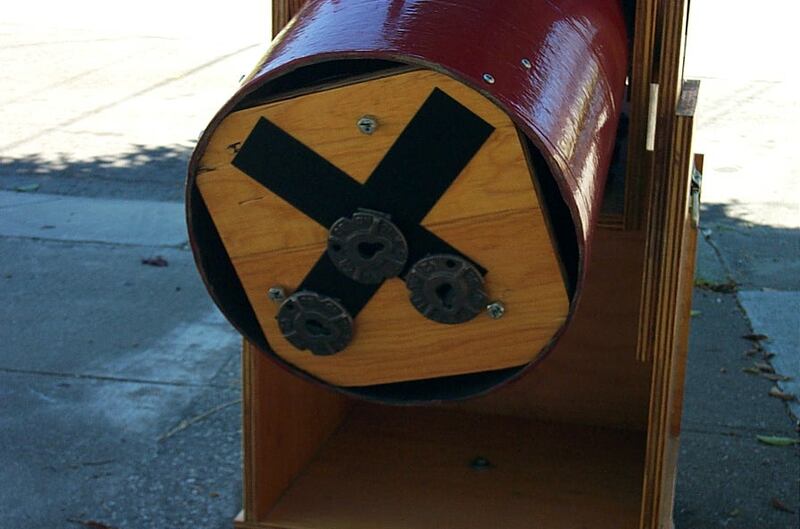 A closeup of the rocker and tube box assembly. 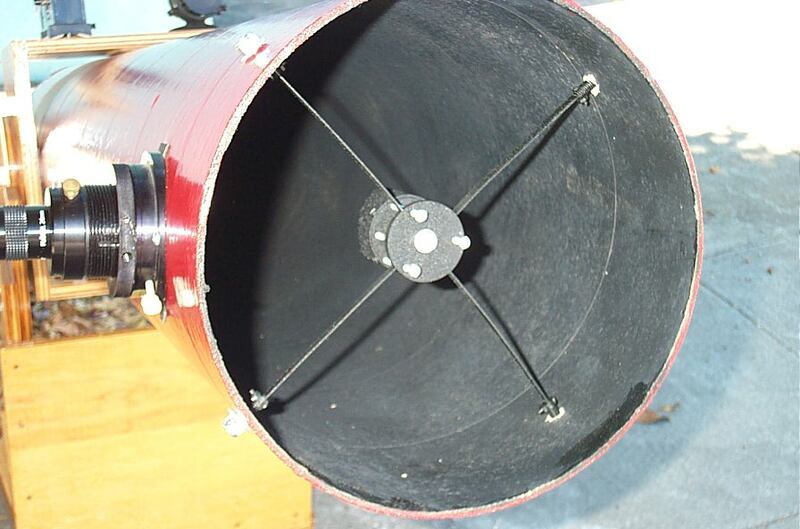 The tube box is attached to the telescope tube right at its balance point. 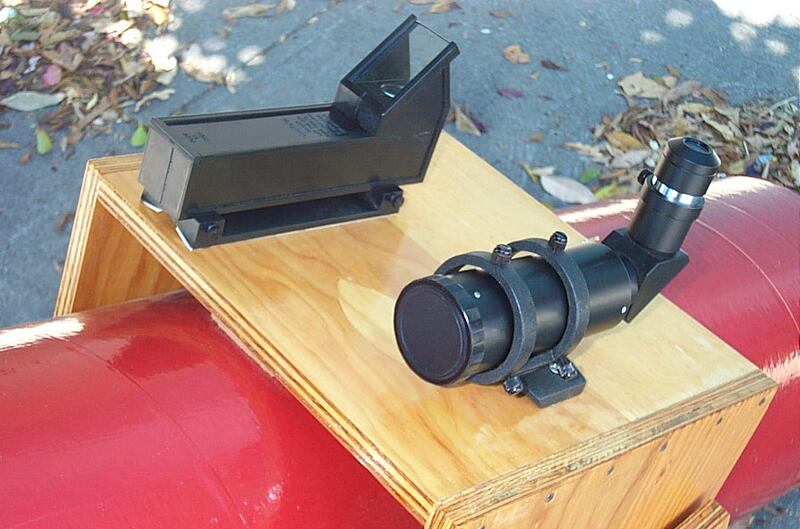 The round bearings of the tube box rotate on small pads of teflon, mounted to the cradle assembly of the rocker box. These are the finders. Together, they help to point the telescope, and to identify objects along a wider patch of sky than the telescope's eyepiece can display. The one on the left is a classic Telrad unit. When you look through the small glass part, it projects a red target ring on the sky, which you can use to point the telescope. The scope on the right is an 8x50 finder scope I bought from University Optics. It has a right-angle Amici prism, so that images do not appear reversed. Essentially, it's one-half a pair of binoculars. This is the telescope's tailgate. The wooden board is attached to the tube with four screws. The main mirror is held in place by the board. Visible in the back of the board are three large bolts. These bolts are used to fine-adjust the mirror's position in the telescope tube. Finally, two black strips of velcro hold three counterweights. The counterweights keep the telescope tube in balance when heavy objects, such as a large eyepiece, are used on the other end of the scope. This is the telescope's eyepiece and focuser. The focuser is attached to the telescope tube; the eyepiece is visible at the very end of it. The eyepieces are interchangeable; each eyepiece offers a different focal length, which translates into a different magnification. Each also shows a varying sized patch of the sky. The focuser is made by Lumicon; I bought it used from a local telescope store. 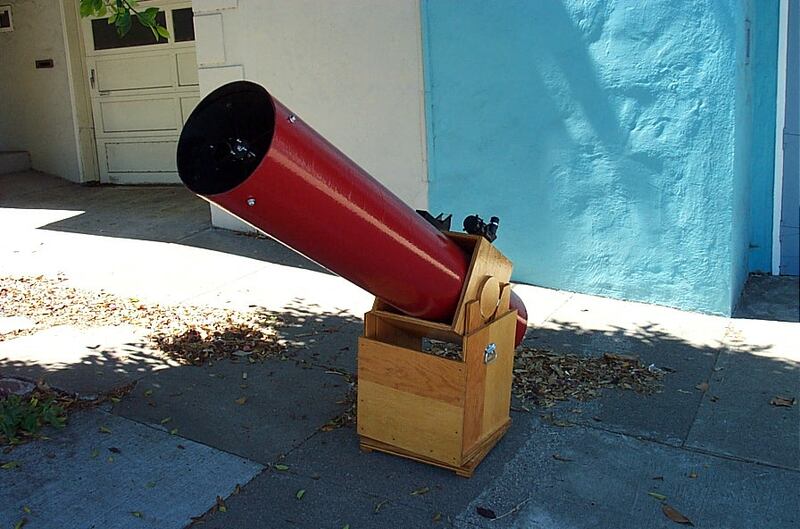 The eyepiece is a Sirius Plössl from Orion Telescopes. The spider. The spider assembly holds the secondary mirror in place. Light enters the telescope, reflects off the primary mirror at the bottom. The primary is slightly curved, so it focuses the light to a point as it reflects back up the tube. Shortly before the light focuses to a point, the secondary mirror reflects it at a right angle, out the eyepiece. The spider assembly also has adjustment screws to fine-adjust the secondary's positioning relative to the primary and the eyepiece. I bought the spider from University Optics. 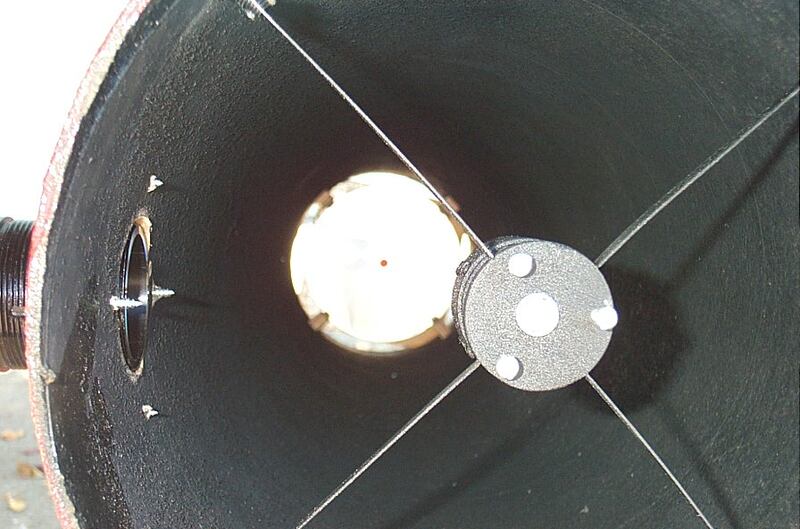 A view right down the telescope tube, showing the spider in the foreground and the primary mirror at the bottom of the tube, resting on top of the tailgate. Only gravity holds the mirror against the tailgate. Dobson's design includes some small brackets placed in front of the mirror, to keep it from pitching forward and falling out the front of the tube. 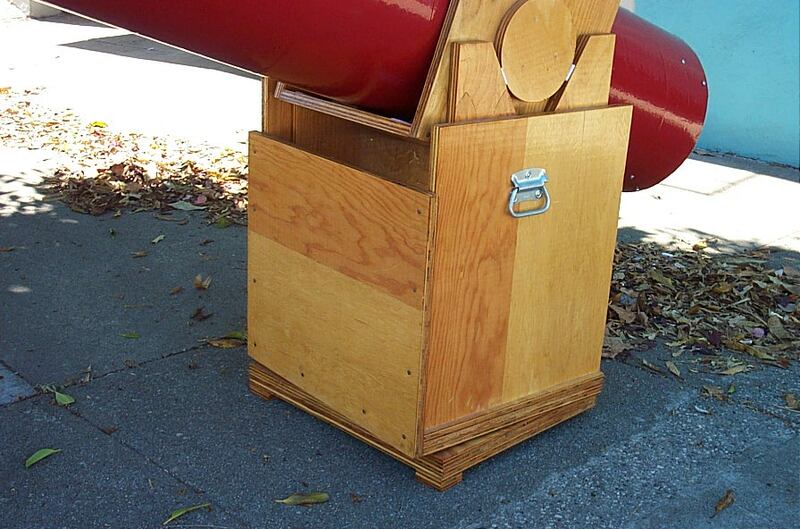 A closeup of the telescope's rocker box. The box is built entirely with straight cuts, from ordinary plywood. The rocker box rests atop the ground board. Again, teflon bearings allow the rocker box to be rotated in a circle atop the ground board. Here, you can see the rocker box just slightly askew of the ground board it rests upon. The two are attached with a bolt as a pivot point. The rocker box has carry handles on the side for ease of transport. It is finished with several coats of clear wood finish, for protection against dew. This is an aperture mask that I made from black poster board. The aperture mask can be used to "stop down" the telescope and deliberately reduce its light gathering ability, much the same way you adjust the f/stop on a camera to lower the exposure on a bright day. This is most useful when viewing the moon, or planets. 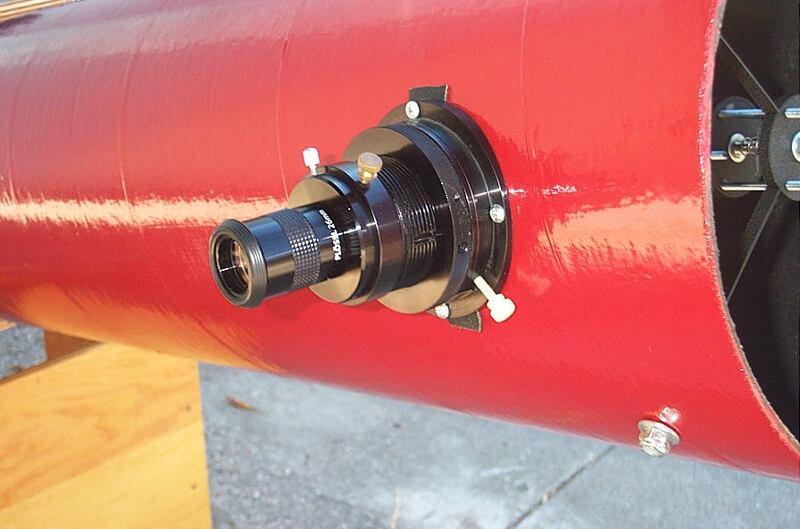 The aperture is sized to be just smaller than the vanes of the spider, so when it is in use the telescope optics are free of obstructions from the spider assembly.